Golf went from the Scottish moor to finely manicured links, to AstroTurf mini-ranges and now it has come inside the mall and gone dark. GlowGolf is the latest mall trend, with a dedicated cadre of devotees who drop $7 per kid to play on the fluorescent course. Yesterday, my daughter Riley and I joined fans at the Natick Collection to play a round, kicking off my 7-year-old’s winter vacation from first-grade. The store is lighted by the so-called black lights once popular in college dorm rooms, and now made famous by CSI sleuths who use them to uncover blood trails. 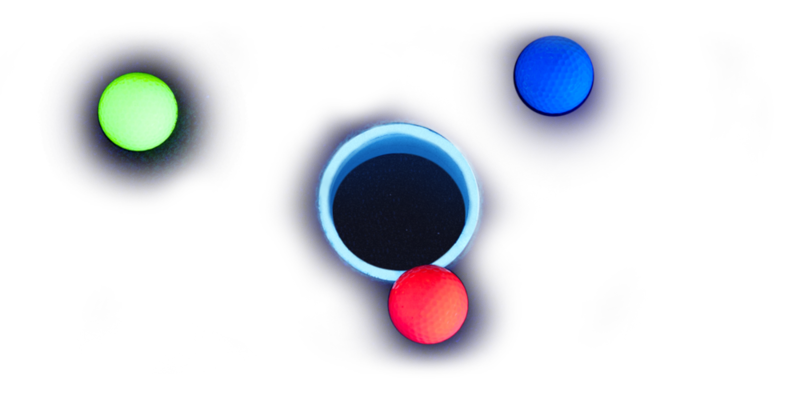 The walls are painted with fluorescent jungle patterns and players hit glow-in-the- dark balls on an 18-hole mini-course. The course and obstacles look very simple, but the designers did a good job of making it a challenge for kids. There are also ball-washing stations, where kids put the glow-in-the- dark balls under an ultraviolet light. Angelica Kontos of Waltham was at the mall for her grandson’s birthday party. Cheryl Judd said she’s been GlowGolfing multiple times with her 4-year-old daughter, Jacalyn. Eleven-year-old Hanna Fitzgerald was having a blast.